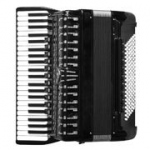 Free album with accordion music: What capitalism was - Plays philip glass on accordion. Homage to Philip Glass. This album is made nearly entirely of accordion tracks. What Capitalism Was samples pieces from Glass’s vast oeuvre. 9 tracks, 30 minutes.